Grocery store alternatives — Which farm-related food option best fits you? While it may seem as though spring is still a long way off, it’s actually the perfect time to start thinking about farm produce. Farmers have already begun planning this year’s crops and those who offer Community Supported Agriculture boxes (CSAs) have opened registration for the coming seasons. The announcement of a new farmers market in Barrhaven has some salivating for those weekend jaunts to buy directly from farmers. Grocery stores aside, there have never been more ways to source veggies – from CSA baskets to veggie boxes to farmers markets – but with our harried schedules, trying to figure out which option is the best fit can seem daunting. Here, a look at the various alternative ways to source farm-fresh fruits and veggies — even in the dead of winter! With the CSA model, you partner with a local farmer by pre-ordering a weekly basket of fresh, local vegetables to be delivered throughout the harvest season. The basket is usually dropped off at locations in the city, and some offer home delivery. Members buy their shares at the beginning of the season; the veggies in the basket vary from week to week (some offer by-weekly delivery as well). CSAs also offer different portion sizes, such as a small box or family size, so you can choose based on what is best for you. With the CSA model, you build a relationship with the people who grow your food. Your contribution means a lot to the farm’s financial security, which can be fragile and subject to external forces, and by paying up front you’re ensuring the farm has sales throughout the season, allowing them to concentrate on growing crops and spending less time selling their produce. You also get the security of knowing where your food is coming from (some encourage visits from their members and even plan special activity days at the farm). Plus, you get the opportunity to try new produce. Here is a map-based list of some of the CSA options that are available in Ottawa. Note that many are only available during the summer and early-autumn months. With this option, groceries are delivered right to your door. The boxes are often on-demand, often highly customizable, and offer either free delivery or a minimal fee. But unlike CSAs, intermediary-run services receive their produce from a variety of sources — often, but not always, local. Because they are receiving fruits and vegetables from several different farms, they can offer more variety. They also tend to offer ancillary products as add-ons, such as dried goods and local artisanal products. With this service, you are able to set up a standing order with most services, choose between a few different sizes and compositions, and can usually swap in or out items of your preference. Also unlike CSAs, you do not need to sign up in advance for a full year of service. Boxes can be built and ordered online, and you pay as you go. You are also not as directly connected with the growers, and some vegetables are sourced from outside of the local area to ensure access to out-of-season items. Vegetable box services tend to operate year-round, often with some seasonal limitations. For providers of this type of service, consider Good Food 2 U, Ottawa Organics, or Eating Well Ottawa as possible services. 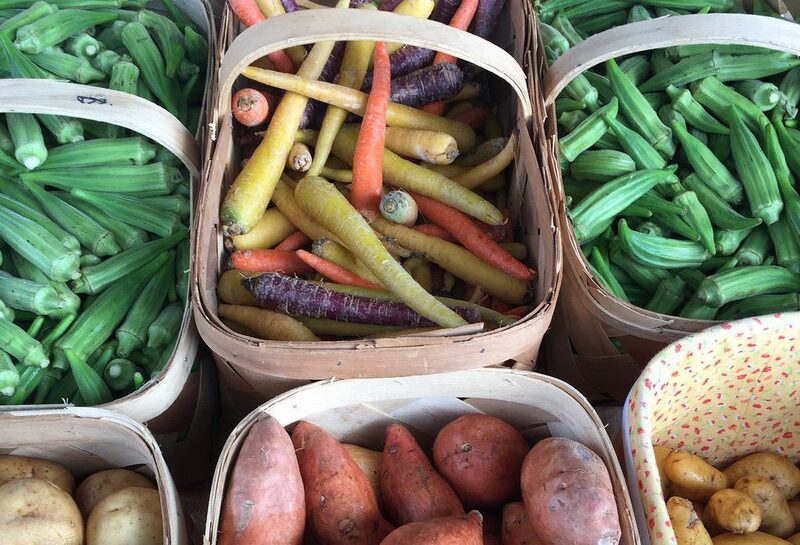 For some, the farmers market is so much more than a place to pick up their weekly produce. It’s a weekend destination, a community gathering place, and a treasure trove of special finds and discoveries. With a truly local farmers market, you are getting the freshest possible produce – often picked that morning – although you are also limited to exactly what is ripe and ready for harvest on any given day. Oftentimes you are also able to interact directly with the farmer, particularly for smaller producers. Here, a list of the many farmers markets in and around Ottawa. Which model works best for me? Each of the three options discussed in this article are a leg up on traditional grocery stores in terms of produce freshness, but a CSA basket and local farmers market stalls tend to offer vegetables that are picked the same day that you take them home. It’s truly farm to table. Both the CSA and farmers market options offer a sense of community that for some is a critical aspect of food and eating. Some CSAs require that you put in a volunteer shift at the farm to bring down costs; it also fosters the sense of connection and community between grower and consumer. You will often come to know your farmer personally when you have a CSA. Farmers markets also offer a community experience, but more so in that a farmers market is a community gathering place and opportunity to make connections and find new businesses to support. If you don’t eat your CSA shares within a week, you’ll be backlogged quickly as new produce rolls in — and some will no doubt be wasted. If you want a consistent quantity of vegetables each week, a CSA basket is your best bet. If you want consistency of what you’re receiving, a vegetable box service will better meet that need. Many CSAs will allow customers to switch out a bit of this for that at the drop off points, but ultimately you are limited to the produce that is available on any given week. For maximum customization, the farmers market and à la carte vegetable boxes offer more ability to scale up or down, and to choose exactly what you want when you want it. Since all farmers markets, CSA baskets and vegetable delivery boxes are different from one another, it’s tough to say which is exactly the least expensive option. However, if you are able to make use of the contents of a CSA basket consistently, it edges out the others for overall cost effectiveness. Scouting the same items in a farmers market will likely add up to more than your weekly instalment plan — plus there’s time involved. But if you miss too many CSA weeks from being out of town, the balance starts to tip away from it. If fruit is a big part of your menu, a CSA may not be the ideal option as many do not contain fruit. However, the farmers market and vegetable box options give you access to several or many farmers, which means getting your fruit fix is more feasible.